The pounds really started to catch up to me after I met my now-huz in college. When we hung out, what we would typically do for entertainment would be to eat food! Unfortunately this tended to be KFC, Leonardo’s pizza (what happened to that place?! ), Wendy’s, or Taco Bell way too often! I decided that I wanted to do something about it. For real this time. Having learned from past crash diets that didn’t work because they left me feeling deprived, I decided to try a new approach: counting calories. As a resource, I consulted Livestrong.com for advice. This site allows you to enter in your height, weight, gender, daily activity level (i.e., sedentary, light, active), and your weight loss goal rate (i.e., lose 1 lb per week), and it will then tell you how many calories you should aim to achieve your goal based on your life style. Based on my goal of losing approximately 1 pound per week, it was suggested that I aim to consume around 1600 calories per day. In May 2010, I started strictly writing down each and every bite of food or sip of beverage I consumed. My strategy was not that I would deprive myself. Instead, I would allow myself to eat anything I wanted, but I just had to count the calories and stay within my goal. Given that I only had 1600 calories per day to work with, it was in my best interest to choose lower-calorie foods if I wanted to eat more food! My disclaimer is that Fridays were my splurge days, and often Saturday dinner would be a splurge meal as well, and I was okay with that. There’s no fun in life if you don’t let yourself indulge once in a while. One month into my calorie-counting system, I was down 5.1 pounds! I even beat out my weight loss goal of 1 pound per week. I continued to use Livestrong.com as a resource for determining the amount of calories in different foods I would eat. Read Month 1 post: HERE. I continued to strictly count calories each day, and after two months achieved a weight loss of 10.6 pounds. I also returned to the weight I was at when I was got married, two years earlier. I found that I did not need to eat as much food as I previously had needed to, in order to feel full. It really does happen, after a few weeks! My calorie goal was reduced to around 1400-1500 calories/day, as I found I didn’t need to eat as much to feel full, as long as I was eating healthier foods. Additionally, my BMI (body mass index) was now in the "normal weight" range, rather than the "overweight" range as it previously had been prior to my dietary changes. Read Month 2 post: HERE. I was down nearly 15 pounds (14.9 to be exact) at the three-month mark. I was consistently losting weight at a rate of 5 pounds per month. I went completely off the diet while on vacation for 4 days. Once I returned, the couple pounds I had gained easily came off and I continued to lose weight at a steady weight, which left me feeling that my weight loss will be sustainable in the long-term if I continue similar habits. As of Month 4, I have lost 19 pounds! I now weight around what I did when I was in high school, so I am lower than I have been in 6 years! My BMI is now 22.6, which is comfortably in the healthy weight range for my height. In the past three weeks, I stopped writing down everything I eat, but still feel that the practice of doing so for the last three months has made me far more mindful and aware of what I eat, as well as more educated as to the calorie counts of different foods, and of the proper portion sizes. I still mentally tally the calories I eat each day, and strive to stay within my goal. I’ve also lost two pants sizes! Read Month 4 post: HERE. A loss of 21 pounds is where I am currently at in Month 5! While the rate of my rate loss has slowed down a bit, that hasn’t discouraged me at all. In fact, I am thrilled that I have continued to maintain my weight loss, but also continue to slowly lose a bit more weight. For the first three months (during which, I was most strict about calorie counting), I was losing about 5 pounds per month. Last month, month four, I lost around 4 pounds, and this month I have lost around two. Now that I am at a weight that is not only healthier, but also one in which I feel better about my appearance, I am not so concerned losing much more weight, but more so concerned about continuing with healthier eating habits, and maintaining a healthy weight. I don’t believe there is any "magic" weight that I would ever achieve where I would feel like my body is 100% perfect – more or less, what I am trying to say is that rather than constantly feeling like I should lose more weight because I’m not a perfect Victoria’s Secret model, I’m more concerned with maintaining a lifestyle where I can sustain a healthy weight at which I feel comfortable, and also not feel completely deprived by starving myself. I could never maintain a diet plan in which I felt deprived and could never allow for indulgences! Clearly you have seen this in my blog! 🙂 Read Month 5 post: HERE. I lost three more pounds this past month, for a net loss of around 24 pounds. I’m not at all strictly counting calories, but I just have an approximate goal number of calories for each meal that I aim for each day. It’s working! Not really focused on losing much more weight, but instead I am more focused on maintaining the progress I’ve made. Read 6-Month Post: HERE. Portion Sizes: I began measuring out portion sizes, so that I could accurately count the calories in the foods I ate. For instance, what I thought was a normal size bowl of cereal, was often much larger than the portion size described on the package, and, unaware to be in the past, I would be pouring 400+ calorie bowls of cereal. I would also measure out an 8 oz. glass of juice, etc. Sodium reduction: High blood pressure runs in my family, so whenever possible I try to buy no-salt added, low-sodium, or reduced-sodium items. I also tend to not add salt, even when called for in a recipe. Eat less meat: I’ve never been a big meat eater. After reading The Omnivore’s Dilemma by Michael Pollan, I had even more motivation to reduce my meat consumption. I have begun reducing my meat consumption quite a bit, and have started to experiment cooking with new whole grains, beans, soy, and other meatless products. More veggies: I started to eat more veggies because I found that I could eat a huge volume of them (and hence, be kept full) for very few calories. I’ve tried out new ways of preparing them (broiling, roasting, steaming, grilling, etc.) and adding different seasonings can mix things up and keep it interesting. Fewer Processed Foods: I have also been trying to be more mindful of reducing the amount of processed foods that I eat. Think hot dogs, frozen meals, chips, packaged cookies, etc. This is NOT to say that I no longer eat these types of food, but instead I am trying to reduce my consumption of them. Fresh, whole foods, with ingredients I can actually identify and pronounce, can be even tastier and make me feel better about what I eat. I don’t need all sorts of additives, preservatives, and chemicals. 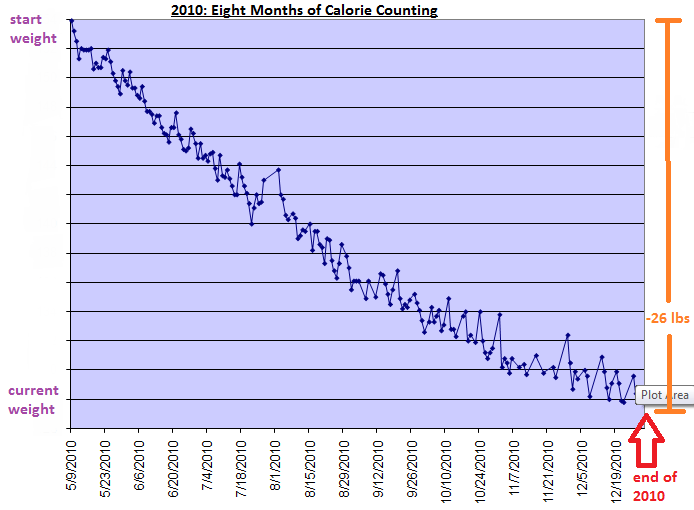 I lost about 26 pounds from calorie counting from May 2010 – December 2010! 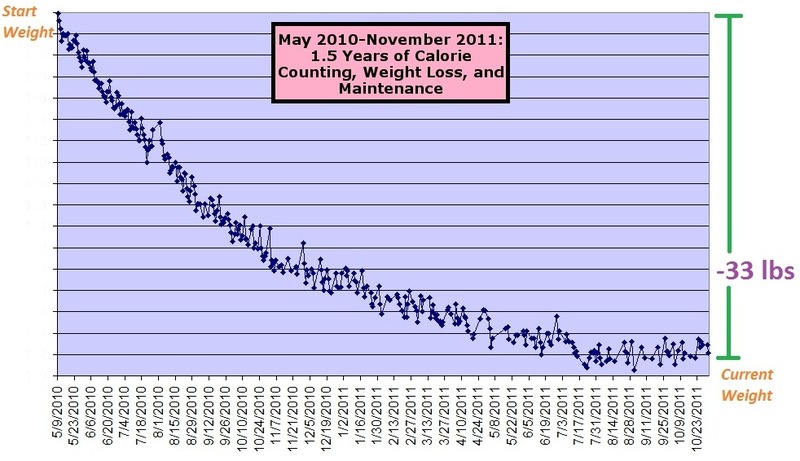 As of the end of February 2011, my total weight loss is now at about 28.5 pounds (which means I’ve lost 18.5% of my body weight!). Since the year began, I’ve been eating less meat (including going vegetarian for one week – read about it HERE), and have begun Jillian Michaels’ 30 Day Shred Challenge (read about it HERE). My BMI has decreased from 26.4 (overweight) to 21.2 (healthy weight) since I began losing weight last May. Normal weight = 18.5–24.9 <—I’m now in this range! I still feel the need to step on the scale nearly every day, just because I need that concrete, tangible affirmation that I am keeping the weight off. I would really like 2011 to be the year that I get in better shape, now that I have tackled weight loss (which was done nearly completely by reducing my calorie intake, with minimal exercise), I would like to add in some fitness and live a more active lifestyle. ..If I can find the time between balancing full-time job, personal activities, blog, etc.! After 1.5 years, I still track my weight and make an daily effort to integrate mentally tallying calories into my lifestyle. I’m flexible and don’t obsess over it, which is what makes me able to stick with it. I’ve managed to drop just a few more pounds, for a total loss of about 33 pounds since I first started calorie counting last year. In June of 2012 I would like to run the Dexter-Ann Arbor race again, and this time do the 10K! Maybe I will even do some other race(s) before then. ..And continued running and doing circuit training workouts (such as Jillian Michaels’ DVDs) in conjunction with calorie counting to maintain my weight loss. Losing the weight is hard, but once it’s off, life doesn’t become easy! It’s still a challenge to maintain the weight loss, which is why it was important for me to find feasible weight loss methods that I could maintain and integrate into my lifestyle. July 2012: Read about my lifestyle two years later, and my current views on meal planning, calorie counting, and weight loss maintenance. Pingback: Month 5 of Calorie Counting « Meg.Goes.Nom.Nom. Pingback: Month 6 of Calorie Counting « Meg.Goes.Nom.Nom. Pingback: Happy New Year’s Eve 2010 « Meg.Goes.Nom.Nom. Pingback: Vegetarian Week – Day #1: Peanut-Crusted Tofu Triangles « Meg.Goes.Nom.Nom. Pingback: Beer, Mac ‘n Cheese, Popcorn, Fried Chicken « Meg.Goes.Nom.Nom. Pingback: Spicy African Peanut Slow Cooker Soup « Meg.Goes.Nom.Nom. Pingback: This Weekend I Ate At The Stinkiest fazoli’s Ever « Meg.Goes.Nom.Nom. Pingback: 98 Pumpkin Cookies « Meg.Goes.Nom.Nom. Pingback: Indian Butter Chicken in a Crock Pot « Meg.Goes.Nom.Nom. Pingback: 5-Ingredient Creamy Light Shrimp Alfredo « Meg.Goes.Nom.Nom. Pingback: What did you do in 2011 that you’d never done before? « Meg.Goes.Nom.Nom. Pingback: Scenes Before Easter « Meg.Goes.Nom.Nom. Pingback: Two Years of Meal Planning and Calorie Counting « Meg.Goes.Nom.Nom. Pingback: Food Monster « Meg.Goes.Nom.Nom. Pingback: Stuffed Chicken Breasts with Mushroom Sauce « Meg.Goes.Nom.Nom. Pingback: My Favorite Chicken Recipe « Meg.Goes.Nom.Nom. Pingback: Spinach Mushroom Enchiladas | Meg.Goes.Nom.Nom.